Print the All-Stars for Jesus banner from the Bible Club Director's Manual CD in color or print it onto colored paper in black and white. Place this banner at the top of your bulletin board and over each club room door. You can also cut out the individual banner letters and attach them to the top of the bulletin board in an arch. Cover the bulletin board with a large sheet of butcher paper, gift wrap, or cloth for a colorful background. Add a star trim border around the edges of the board. Make a colorful border by cutting construction paper strips. You can be as creative as you want by cutting the border strips in fancy or decorative shapes. Add Bible stickers or glue star cutouts around the border to make it pop. A three-dimensional effect is attractive to children. Make flowers out of egg carton cups. Put a layer of thick cardboard behind some of your bulletin board figures to make them stand out. Attach materials to the bulletin boards using staples, as they are much more difficult for younger children to remove and swallow. Be sure that no loose staples are left on the floor after you've completed the board. 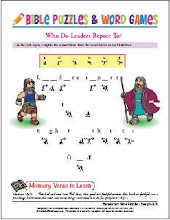 Make interactive bulletin boards: Mount a mirror on the board, covered with a piece of cloth. Place a picture of Jesus beside the mirror. Guide the children to the board. Ask, Who is important to Jesus? Look and see. Make this special Happy Honeybees bulletin board: Cut out one Happy Honeybee for each child. 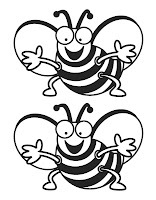 Label the honeybee with the child's name. Cut flowers and stems from construction paper or craft foam. 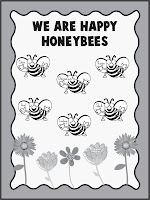 Title the board, “We are Happy Honeybees.” As new children are enrolled in Honeybees, add more bees to the bulletin board.